Attract Woodpeckers with Suet, Sunflower and Peanut feeders on Squirrel Proof Bird Feeder Poles. Woodpeckers love Suet, Sunflowers and seed wreaths in their special feeders. By providing their favorite foods, Woodpeckers will be sure to come to your backyard for you to enjoy. Some of the Woodpeckers shown below are the Downy, Hairy, Flicker, and Red Belly Woodpecker. The male and female often have a patch of red that identifies them. Bird Seed Wreath is a Birdie Wreath of quality bird seed for Spring/Summer. Attractive design makes a nice holiday gift. Copper Double Suet Feeder is a Deluxe Double Suet Cage bird feeder with Copper Electroplated Roof that holds two standard size suet cakes. The Rooftop helps to keep suet protected from the weather. Great for feeding clingers year-round. Recycled Suet Bird Feeder with tail prop for woodpeckers like this Flicker is a recycled plastic bird feeder in Hunter Green and Driftwood. Scarecrow Metal Bird Feeder is a wire mesh metal bird feeder which makes it a squirrel and pest resistant Feeder. The wire mesh feeder is about 9" x 10" that attracts many birds like: Woodpeckers, Chickadees, Nuthatches, Blue Jays, etc. The wire cage feeder gives clinging birds lots of area to feed at the same time. Squirrel Proof Suet Duo Bird Feeder is squirrel proof suet feeder with metal wire cage and roof. Very easy to fill with two suet cakes. Suet recycled bird feeder is a great way to be Going Green. You and your birds benefit by choosing recycled products because these recycled plastic doesn't absorb water, so it won't harbor mold or bacteria. Sunflower Metal Bird Feeder is a wire mesh metal bird feeder which makes it a pest resistant Bird Feeder. Squirrels and undesirable birds (Grackles, Doves) have a hard time cleaning out this type of metal feeder. The wire mesh feeder has about a 9" diameter that attracts many birds. Sunflower Seed Mesh Bird Feeder is a squirrel resistant metal wire mesh sunflower Feeder. 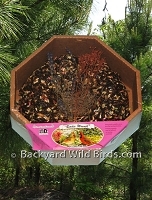 The Sunflower Seed Bird Feeder is a very good bird feeder to attract many different wild birds. This bird feeder works for perching birds like Cardinals and clinging birds like Woodpeckers who go all over the wire mesh. Sunflower Seed Wreath is a nice decoration to hang from a tree to attract birds and to feed themselves with a great source of energy. Recycled Plastic Upside Down Suet Bird Feeder in Hunter Green and Driftwood. 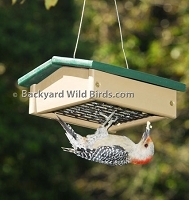 Lets " Go Green" and feed your Red Belly Woodpeckers in style! Whole Peanut Feeder Wreath is a unique way to attract Woodpeckers, Nuthatches and other nut loving birds. 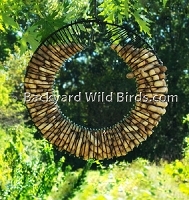 The circle of life spiral bird feeder lets birds peck away until they get their reward. 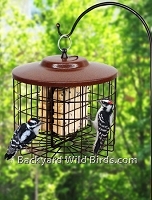 Woodpecker Peanut Bird Feeder is a bird feeder that is a 13 inch tall stainless steel wire mesh tube bird feeder. This feeder will hold peanuts and black oil sunflower seeds.